Today is the day when all Slow Bloggers are invited to join in the monthly linky party. You don't have to be a permanently slow blogger - if you have had a fast month and been craftily creative join in and celebrate your achievements here whether you made one thing, or a whole mosaic load. Or tell us what else you've been up to if real life has been taking up your time. 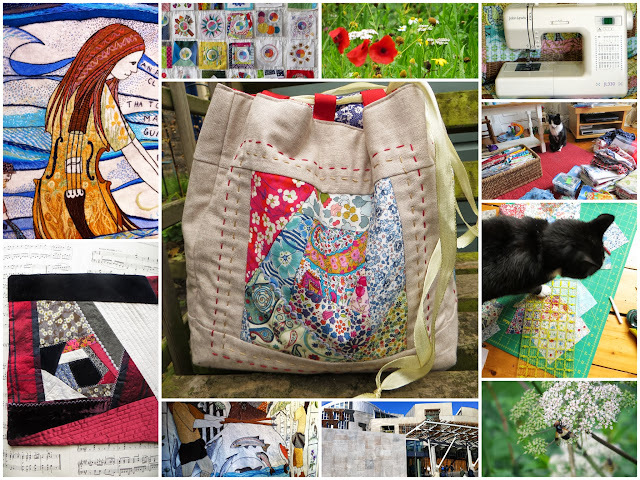 taken some walks in the countryside, bought a new sewing machine, attended the Stitch Gathering, learned how to make crazy patchwork, sorted out my stash, been photobombed by a cat, visited the Scottish parliament, seen the Great Tapestry of Scotland, made a Liberty komebukuro bag. Seems like you've had a busy month too Catherine.......love your patchwork bag. I do love that Liberty bag :D was the tapestry on tv last week? I've been a really slow blogger recently - darned home improvements - but now I'm getting back into the swing of things - thanks for the opportunity to share. Doesn't sound slow to me - you have done a lot in a short amount of time by the look of it! I see the Assistant still sitting supervising the stash clear out! I am going to give you the YAY of the day!! Hallelujah!! I am not the only lost soul who doesn't blog twice or three times a week. Me thinks I am going to love this linky party!! Love, love, love the bag and the violin lady. Just visiting your lovely blog from the bottom of the world! !